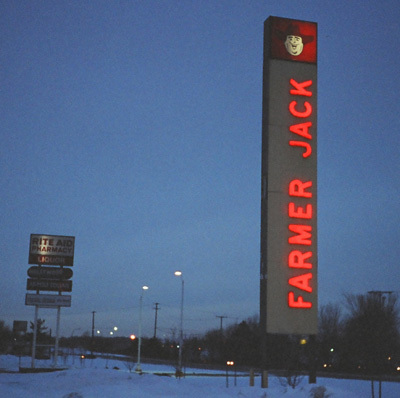 This is of the former Farmer Jack in Hamtramck, Michigan. It closed in early 2004. It reopened as a Food and Drug Basics. This store closed as a Food Basics in late 2004 or early 2005. 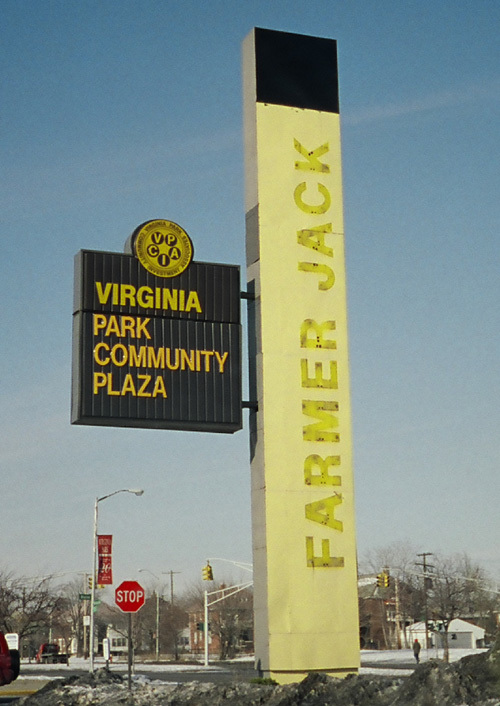 This is of the former Farmer Jack on Rosa Parks Boulevard in Detroit. It also became a Food Basics. 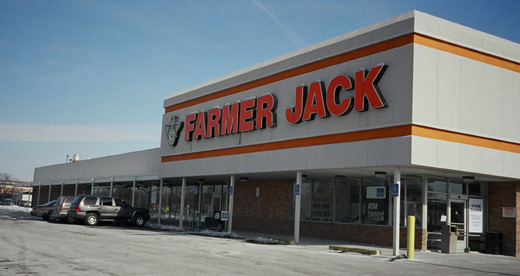 This store was in Harper Woods, Michigan, on Harper between Kingsville and Bournemouth streets. It is next to the Detroit city limits. It too closed and was converted to Food Basics. This is in Ypsilanti, Michigan, at the Gault Village shopping center. The store closed around the same time as those others but became an independent. The sign still stands along I94 but says "SUPERMARKET." This shopping center also has a boarded up K Mart (closed since the early 1990s I think) and a colonial A&P now serving as a Family Dollar. This is in Melvindale, Michigan, on Oakwood Boulevard. This exterior is pretty original (except for the green paint and the signage) and the sign is totally 1970 or so. This store became a Food and Drug Basics. 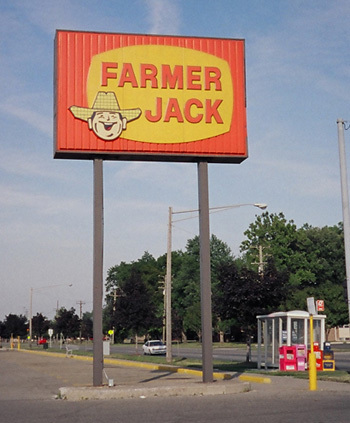 This is the Farmer Jack on Monroe Street in Sylvania, Ohio. It was originally a Churchill's Supermarket (supplied by Spartan Stores). This location was an early supermarket/drug/general merchandise combination store and is quite large in size. The secind photo is of the rear entrance. This A&P is in Owen Sound, Ontario, near the downtown area. 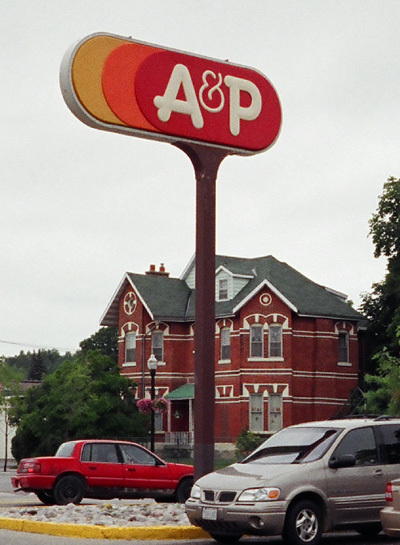 Notice the road sign; most A&P road signs of that shape have the yellow and orange on the other side of the red on one side of the sign, but on the other side is the normal A&P logo. These A&P stores are in Sarnia, Ontario. The top store is near the Lambton Mall and appears newer than the lower store, on Exmouth Street (I think that's where it is...). This is in Niagara Falls, Ontario, at Morrison and Thorold Stone roads. It appears to be of fairly recent vintage. This too is in Niagara Falls. I believe it used to be an A&P. This is Rick & Sharon's Food Basics in Strathroy, Ontario.